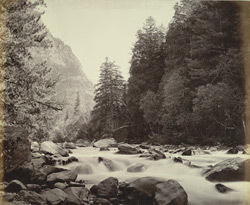 Photograph of cascades on the Sind River in Kashmir, from the Macnabb Collection, taken by Samuel Bourne in 1865. The Sind River is a tributary of the River Jhelum, and runs through the Sind Valley. Its source is considered to be the sacred Lake Gangbal on Harmukh Mountain. The Sind flows for sixty miles joining the Jhelum at Lake Anchar at Ganderbal. Bourne undertook three extensive expeditions to Kashmir and the Himalayas between 1863 and 1866, and submitted a number of the resulting photographs to the 6th Annual Exhibition of the Bengal Photographic Society of 1863. He impressed judges and critics with the clarity and composition of his images, and won a gold medal for one of his views of Wanga Valley.